Effective in controling Nausea and Vomiting from any stimulus. Effective in Chemotherapy Induced Nausea and Vomiting (CINV). Effective in Pre and Post-Operative Nausea and Vomiting. Premedication in upper digestive endoscopies. Prokinetinc in upper GIT disorders. Improve symptoms in Gastro Esophageal Reflux Disease (GERD). Each tablet contains : Alizapride hydrochloride 55.8 mg equal to 50 mg of alizapride. Each ampoule contains : Alizapride hydrochloride 55.8 mg equal to 50 mg of alizapride. It is suitable in the vomiting and nausea of various origins, including pre- and post-operative vomiting and nausea, with the exception of vomiting during pregnancy. Particularly suitable for the treatment of vomiting and nausea associated with anti-cancer therapy. Tablets: 2-4 tablets per day, unless different medical prescription. Ampoules: Usually, 1-4 ampoules every 24 hours, unless different medical prescription. When treating nausea and vomiting caused by antineoplastic chemotherapy , the following dosage is recommended : 2 ampoules administered intravenously 20 –30 minutes before the start of treatment , followed by 1-2 ampoules administered intramuscularly 4-8 hours later . In the case of strongly emetic treatment , the daily dose can be increased up to 4 times , administering 4 ampoules intravenously 30 minutes before antineoplastic therapy , 4 ampoules intravenously together with antineoplastic therapy , and up to 8 ampoules intravenously or intramuscularly , at the rate of 2 ampoules every 4 hours , depending on the intensity and frequency of vomiting . The administration of one ampoule intramuscularly is recommended for the treatment of preoperative nausea and vomiting. In postoperative vomiting, 1 ampoule 2-3 times a day by slow intravenous infusion or i.m. Initial parentral treatment can be continued as maintenance therapy together with other pharmaceutical forms. 1- Use in Pregnancy & Lactation? Pregnancy: Only animal studies were performed in pregnancy (Rabbits) where Nausilex didn’t show any teratogenic effects. Lactation: No studies were performed on lactating mothers. 3- Increasing the dose frequency should increase the incidence of side effects or not? Dose shouldn’t be taken for longer than 7 days. 4- If the Dr wants to compare Nausilex to other anti-emetics in the market, should we direct him for comparison with Metoclopramide or Ondansetron? Nausilex shouldn’t be compared with any other brands, we have to build our unique profile and image as a SELECTIVE D2 blocker that has MINIMAL INCIDENCE OF EPS, due to minimal crossing of the BBB, however if the physician wants to compare we can benefit from that as Nausilex is 3 times more potent than Metoclopramide, and more safe, and if compared to Ondansetron its much more cost-effective. 5- Use in patients with renal insufficiency? According to the Alizapride data sheet, dose should be decreased. 6- Does it cause Sedation? As already stated before, Nausilex has minimal crossing of BBB thus it is less likely to cause central side effects, also sedation is not listed as a main side effect. 7- Compatibility of Nausilex when added to Ranitidine or Dexamethasone? Alizapride is compatible with both. 8- Main side effect in case of over dosage by mistake? According to the product insert EPS is listed as the first side effect in the case of overdose, also it’s reversible once the plasma levels return back to normal. 9- Can Nausilex be prescribed with other antiemetic? There’s No Need to prescribe other antiemetic with Nausilex as it is effective in ALL GRADES of Nausea & Vomiting. 10- Nausilex compatibility with anesthetics in premedication before surgery? No incompatibility is listed with any anesthetic so it can be safely used. 11- Mixing Nausilex with Zantac in the same ampoule? Nausilex can be safely mixed. 12- Some GIT Drs prefer using Nausilex as a post-Endoscopy medication not a premedication? Studies conducted in endoscopy was as a premedication, also from market feedback; Nausilex proved efficacy as premedication, however if the Dr wants to use it post-Endoscopy then it’s up to him. 13- Mixing in infusion should be with saline or Glucose? Nausilex can be mixed safely with both. 14- Injection can be only by IV infusion or also direct IV? Both routes can be used. 15- Some Drs inquire about the oral form? MinaPharm studied the trend of antiemetic therapy before choosing to produce the parentral form of Nausilex, the result was an increased used of the parentral antiemetics in the last few years. 16- What is the chemical structure & Chemical group of Alizapride? 17- Can Nausilex be taken as IV INFUSION with Ringer? Ringer is an isotonic solution composed of: Potassium chloride, Sodium chloride, Calcium chloride & Sodium bicarbonate, all these chemicals do not have any drug interaction with Alizapride according to the insert. 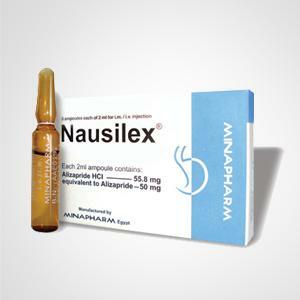 18- Does Nausilex used with HICCUPS like Metoclopramide? No studies performed in Hiccups, but we can make use of more market feedback in this indication. 19- If there are any drug drug interaction with Antiepileptic drugs? Some antiepileptic medication have CNS sedative effects, Alizapride might enhance the sedative action of CNS sedating drugs...according to the insert. 20- Mechanism of Alizapride as A pro-kinetic ? If Nausilex effects on D2 IN Stomach? Same mechanism of Antiemetic action; selective D2 antagonist in the CTZ, no information found about D2 in the stomach. 21- C.T.Z.FOUND IN BBB(the first picture in brochure). , And we claimed Extra Pyramidal Symptoms are rare to occur ..how come?? As explained in the training; BBB is not a distinct line before the CNS, it is a tight junction of capillaries that becomes more tight when getting closer to the CNS, the CTZ is located where the BBB is less tight, so drugs that work selectively on the CTZ might not pass across the BBB. N.B: this is a very important part of the medical background and it must be insured that all is fully aware of it. 22- Some doctors ask about what the different bet. Alizapride as pro-kinetics and mozapride and domperidone. Mosapride, Cisapride & Domperidone are mainly prokinetics, restoring gastric motility is their primary action, while Alizapride is mainly a potent antiemetic with Prokinetic action.